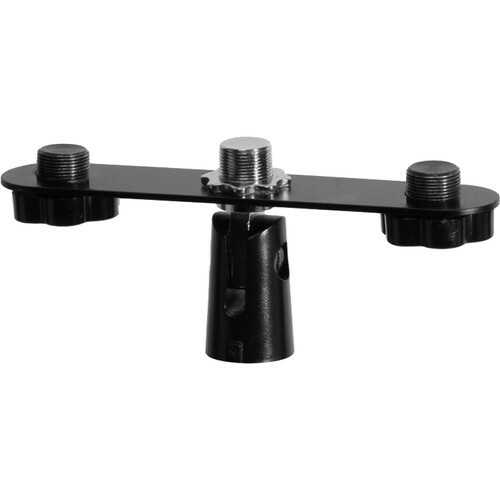 The On-Stage MY500 Stereo Microphone Mount allows you to mount 3 microphones on a single mic stand. Box Dimensions (LxWxH) 9.0 x 3.8 x 0.6"
MY500 Stereo Microphone Mount is rated 3.0 out of 5 by 6. Rated 1 out of 5 by Cable Wrangling Mike from Cheap for a reason I expect what I pay for, and for $ I expected to get a product that can hold two microphones on a stand, and not much more. When I received the product it didn't even do that. First time I put the mics on the bar, I discovered the threads were too shallow on one of the studs. When I tried to remove the clip I twisted off the plastic knobs. Long story short, the only component of your recording rig you might expect you could safely cheap out on, don't. Rated 5 out of 5 by Dave Combs the Composer of Rachel's Song from Looking for inexpensive stereo mic mount Used the MY500 Stereo Mic Mount to record a chamber music performance. It worked perfectly. Rated 1 out of 5 by Don from Poor design leads to never upright mics This product should be discontinued. The idea is good, however the execution is poor. The bottom piece should not twist up and down, it should be solid. When you add any weight to this the whole top bar bends down and the mics get out of place. There is no way to tighten it. You can try to gaffe it but that looks terrible and it doesnt work. I literally just threw it away. Buy the On-Stage MY700 instead. Its a much better design. Rated 2 out of 5 by Scott from You get what you pay for I bought this to use for recording live concerts with a stereo mic setup (think Phish, DMB, etc.). Within a year after getting this, the plastic center mount broke at a show after a gentle bump. I ended up taking the bar off the mount and mounting the bar directly to my mic stand, where it remains to this day. It works, but the angle of the bar is no longer adjustable. Rated 4 out of 5 by a recording student from nice product simple to use, functional. I can set it up for ORTF configuration. It does not have all the measurements to set it up, but it is not too difficult to measure yourself. Rated 5 out of 5 by DARIO from I would buy this product again and again I use to reamp Rototoms! Fantastic!! !